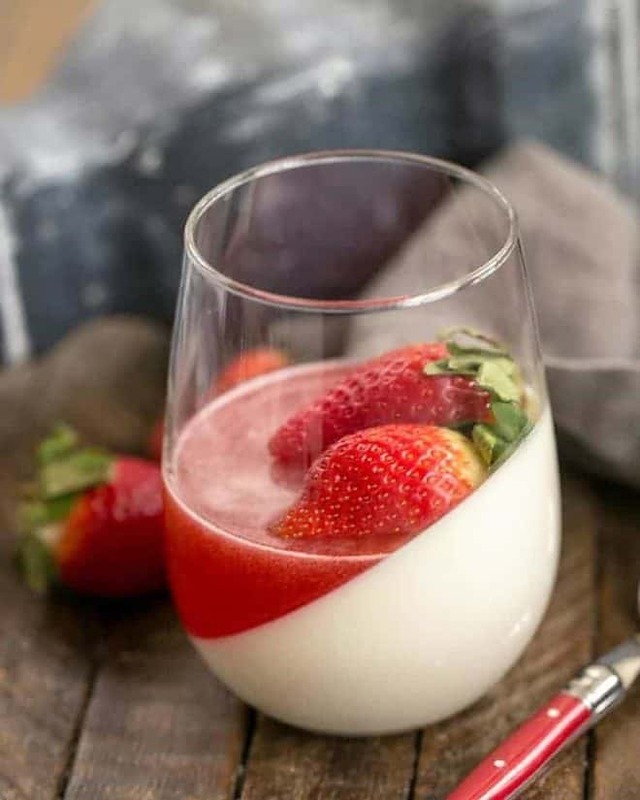 Luscious and smooth, this easy vanilla panna cotta topped with strawberry gelee was a spectacular dessert for the eyes and palate. I chose a lovely strawberry topping, but, alternatively, serving with a side of strawberry sauce would have been just as nice. On this second attempt, seven years after my first, I angled the glass serving dishes as I placed them on a tea towel lined muffin tin. I wasn’t sure how I’d move these precariously perched glasses and tin into the refrigerator, but thankfully, I did. This extra step was so the panna cotta layer chilled and solidified on an angle. 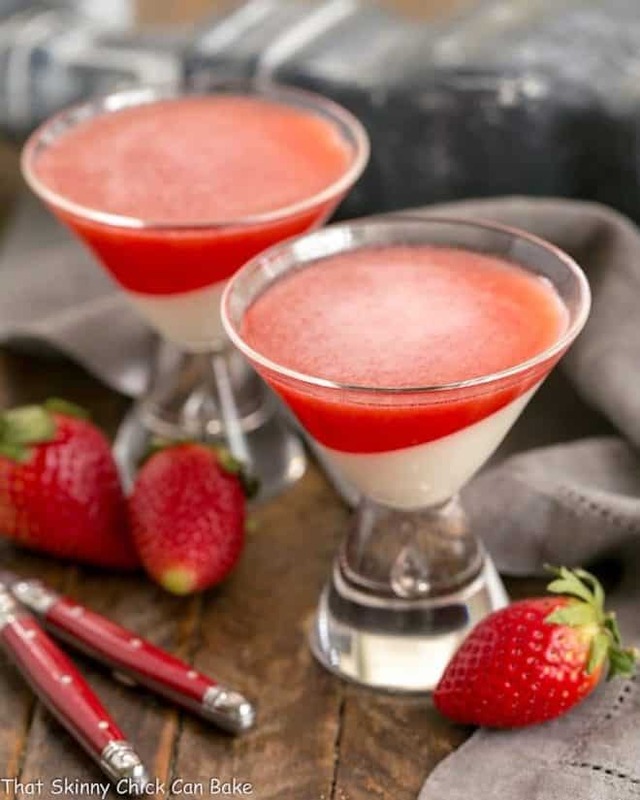 Once that layer was firm, I turned the glasses upright before adding the strawberry gelee! 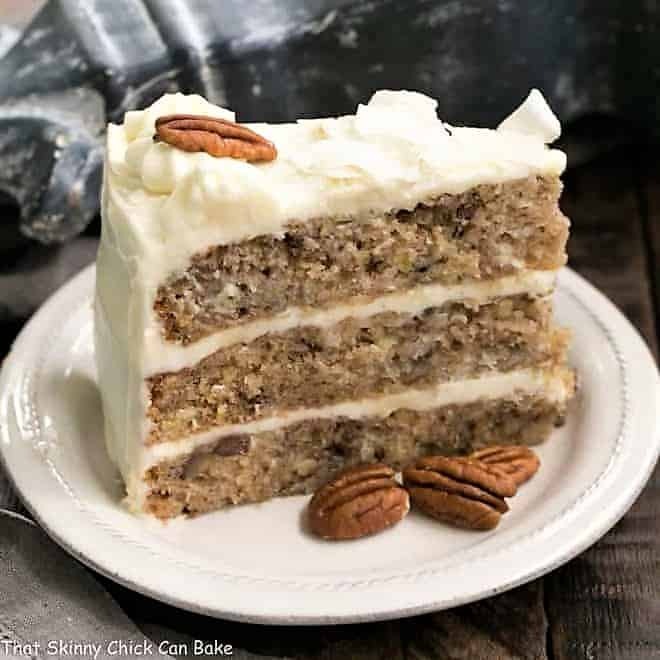 My first go round of this recipe was in 2011 as part of the Daring Bakers group. Mallory from A Sofa in the Kitchen challenged everyone to make Panna Cotta from a Giada De Laurentis recipe and Nestle Florentine Cookies. With that batch, my strawberry gelee was more red than pink; it all depends on the color of your berries. I ended up making a triple batch of the gelee, but still didn’t have enough to fill the all the angled voids created from chilling the panna cotta on an incline. Feel free to make layers flat and parallel, but I think you’ll still want a double batch of the jellied topping. Pour the milk into a saucepan and sprinkle gelatin evenly and thinly over the milk. Let stand for 5 minutes to soften the gelatin. Place over medium heat on the stove. 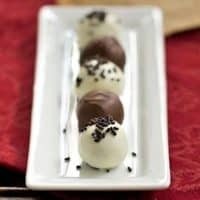 Add vanilla bean. Heat this mixture until it is hot, but not boiling, about five minutes, whisking occasionally. Next, add the cream, honey, sugar, and pinch of salt. Making sure the mixture doesn’t boil, continue to heat and stir occasionally until the sugar and honey have dissolved 5-7 minutes. Remove vanilla bean. Remove from heat, allow it to sit for a few minutes to cool slightly. Then pour into glasses or ramekins. If you’d like an angled version, place a towel across a muffin tin and set the glasses in the tin at a slight angle before pouring. Refrigerate at least 6 hours or overnight before adding gelee. To make gelee, sprinkle gelatin over water. Place fruit and sugar in a small saucepan and simmer until sugar has dissolved. Now mix the gelatin into the strawberry mixture and stir until gelatin has dissolved. 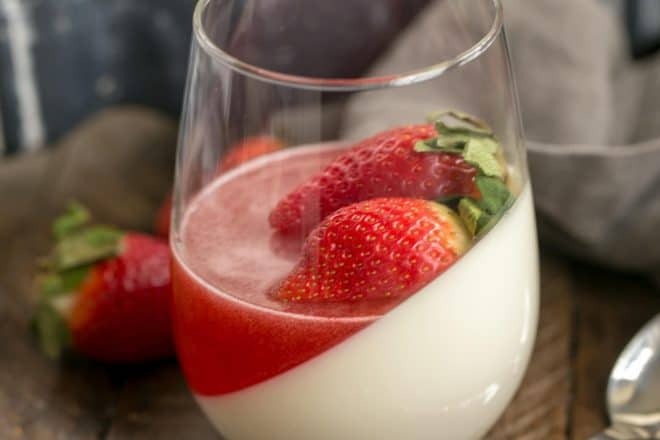 Remove from heat, strain and allow to cool (close to room temp, again, if you’re planning on layering on pouring on top of your Panna Cotta, a hot mixture will melt your chilled Panna Cotta). Divide the gelee between the vanilla panna cottas. Chill until gelee gels. 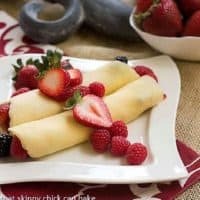 Serve with fresh berries, if desired. Servings will vary depending on the size of your serving dishes. *Triple the gelee if you want the angled presentation. A light and very beautiful dessert! Liz, they are so pretty! It’s ages since I made Panna Cotta and so it’s a wonderful idea. Our strawberries are not out yet but when they do, can’t wait. 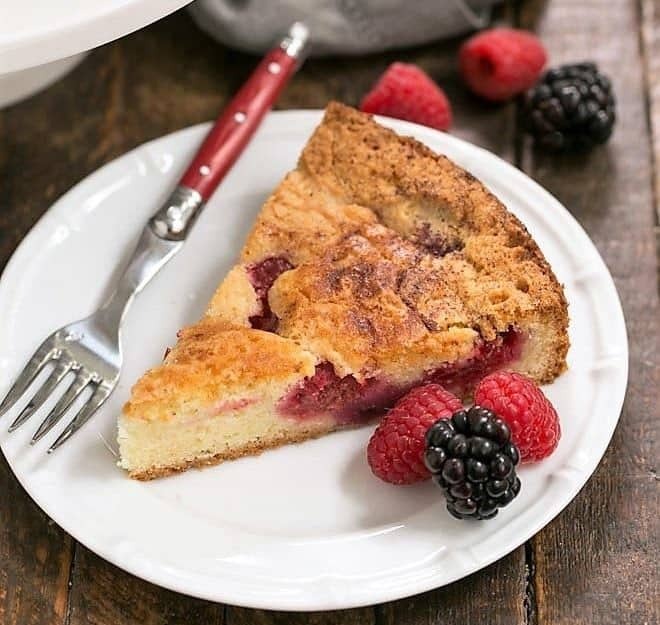 Love that your topping is so full of berries and bursting with flavour! My panna cotta needs to look like this I just have to make this every one will think I bought it. This is gorgeous! This is beautiful! And easier to make than I though! These are so pretty Liz – what a great dessert for the upcoming Easter holidays. Pinned! 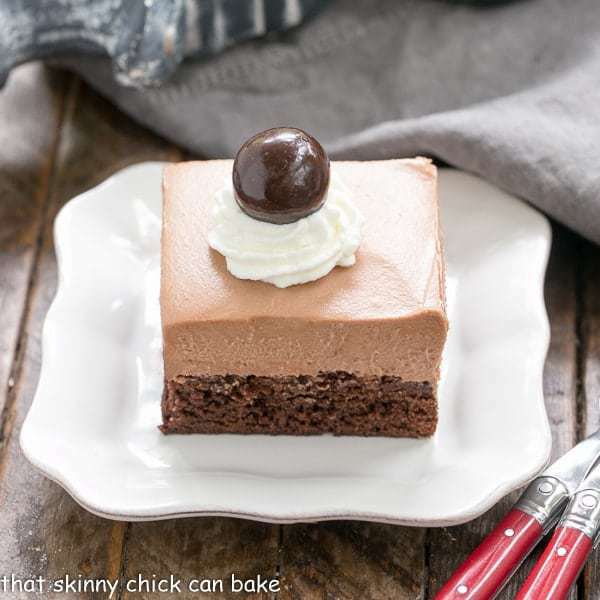 This looks so elegant and also so very tasty! These are so beautiful! Simple and elegant, and so flavourful! Love these for a dinner party Liz!! I’ve seen this before and have always thought it looked so pretty. I haven’t made it yet but it’s on my list. It’s almost too pretty to eat. Yours looks perfect! 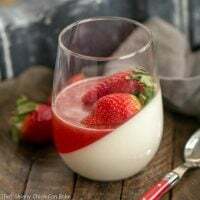 I haven’t made panna cotta in ages- this looks gorgeous and is gluten free too -must give it a try! This is such a gorgeous dessert. Love how you made it fancy with the angled effect. 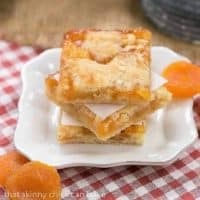 Perfect light dessert to head into spring with. Pinned! This is a real showstopper Liz! I was a member of the Daring Bakers at the same time and my panna cotta was not noteworthy! As beautiful as tasty I am sure. they look adorable! 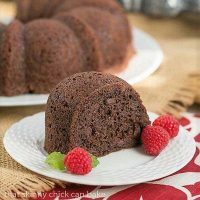 I’m looking for some special desserts for my mother’s birthday next weekend.